It’s no secret that when it comes to Olympic basketball, the US is downright dominant. That isn’t likely to change in the 2012 Olympic Games in London either, considering Team USA is undefeated in 2012 exhibition games both on the men’s and women’s side. Watch 2012 Olympic Basketball live online for free beginning on Saturday, July 28 at 4am ET to see if another country has what it takes to dethrone Team USA. Team USA is going for its 20th Olympic gold medal in basketball at the 2012 Olympic Games in London and probably won’t face much of a challenge from any team other than Spain, Brazil and Argentina. With an all-star roster that includes Lebron James, Kevin Durant, Carmelo Anthony, Kobe Bryant and eight other NBA stars, Team USA appears to be unbeatable, so be sure to watch them live online for free to see if another country can shock the world and upset them. Though Argentina gave Team USA its biggest challenge in exhibition, losing by just six points, Spain is expected to face Team USA in the final gold medal match-up. Of all the Olympic basketball teams other than the US, Spain has the most NBA talent. They also out-match Team USA in size with big men like Marc and Pau Gasol and reigning NBA shot block leader Serge Ibaka. Watch Olympic basketball live online for free to see if Spain can challenge Team USA after losing to them by 22 points in a pre-Olympic exhibition game. Other basketball players to look out for in the 2012 Olympic Games are Argentina’s Manu Ginobili and Luis Scola, Brazil’s Leandro Barbosa, Great Britain’s Luol Deng and France’s Tony Parker. You can watch all of these players represent their respective teams live online for free when Olympic basketball tips off. As the overwhelming Olympic gold medal favorite in women’s basketball, Team USA is ready to take the court and start running through the competition and you can watch them play live online for free. They will be going for their fifth straight Olympic gold, while Australia, the winners of three straight Olympic silver medals, will look to challenge Team USA for the top spot on the podium. China and Russia will also be podium contenders as Olympic women’s basketball streams live online for free beginning on Saturday, July 28. Women’s Basketball Preview – Saturday, August 11: It will be Team USA vs France in the Gold Medal Game at 4pm ET with Australia and Russia facing off in the bronze match at noon. Win or lose, France will receive its first-ever Olympic medal in women’s basketball, while Team USA is going for its fifth-consecutive gold. Men’s Preview – Friday, August 10: Argentina will get another shot at Team USA when the two teams meet on Friday (4pm ET) for the second time in the Olympic basketball tournament. This time, it’s to decide who will go on to the Gold Medal Final. Meanwhile, Spain will be playing Russia at 12pm ET in the other semifinal match-up of the day. Look for Argentina’s Manu Ginobili and Luis Scola to have big games against a Lebron James, Carmelo Anthony and Kevin Durant-led Team USA. Women’s Basketball Preview – Thursday, August 9: The reigning gold and silver medalists are set to battle it out on the court tomorrow as Team USA takes on Australia in the Semifinal at 12pm ET. Australia has won the silver medal in three straight Olympic Games and are hungry for their first Olympic gold medal. Team USA on the other hand has taken home the gold in four straight Games and there’s every reason to believe that they win it all yet again in London. The other semifinal game will be between France and Russia at 4pm ET. Russia is looking to take home an Olympic medal for the third-straight time. Men’s Basketball Preview – Wednesday, August 8: As Quarterfinals for Olympic Men’s Basketball get underway on Wednesday morning, the match-ups that you’ll want to be sure to watch are France vs Spain at 11:15am ET and Brazil vs Argentina at 3pm ET. Team USA will be taking on Australia in the final quarterfinals game of the day at 5:15pm ET and although Lithuania, in uncharacteristic fashion was almost able to upset the reigning Olympic champs last week, Australia shouldn’t even get close, with an emphasis on shouldn’t. Lithuania will be competing on Wednesday at 9am ET against Russia. Players to watch for include Team USA’s Lebron James and Carmelo Anthony, France’s Tony Parker, Argentina’s Luis Scola, Spain’s Jose Calderon and Brazil’s Leandro Barbosa, who recently led his team to the No. 2 seed after defeating Spain. Women’s Basketball Preview – Tuesday, August 7: We’re now in Quarterfinals for Olympic Women’s Basketball as live coverage picks back up on Tuesday morning at 9am ET when Team USA goes against Canada. Team USA ran through China with ease in its last game and you can look for the team to stay on that pace as the clear gold favorite. Other games taking place on the women’s side are Australia vs China (11:15am ET), Turkey vs Russia (3pm ET) and France vs Czech Republic (5:15pm ET). Players to watch include Australias Lauren Jackson, Canada’s Kim Smith and Team USA’s Candace Parker. Men’s Basketball Preview – Monday, August 8: Closing out the day for men’s basketball today are two great match-ups between arguably the best four teams in the Olympics. Spain and Brazil will go at it at 3pm ET and Team USA will battle a Manu Ginobili-led Argentina. These could both turn out to be very close games that comes down to the wire and you can watch them live online for free. Team USA came dangerously close to getting upset by Lithuania last week, so expect Argentina to really challenge them. Men’s Basketball Preview – Saturday, August 4: You can certainly count on Team USA to blow past Lithuania in their 9:30am ET game on Saturday after they slaughtered Nigeria Thursday by a final score of 156-73, setting a new Olympic scoring record. Look for Carmelo Anthony to follow up his 37-point performance with another solid game on Saturday. A few other preliminary match-ups to look forward to on Saturday are Spain vs Russia at 6:15am ET and Australia vs Great Britain at 3pm ET. Women’s Basketball Preview – Friday, August 3: Preliminary matches for women’s basketball start at 4am ET and will stream live online. The best match of the day will likely be Russia vs Australia at 6:15am ET as they are the reigning Olympic bronze and silver medalists respectively. Team USA take on Czech Republic at 5:15pm ET in the last game of the day. Key player to watch out for in the preliminaries are USA’s Angel McCoughtry, who can score in bunches, Brazil’s Erika de Souza, Australia’s Lauren Jackson and Russia’s Becky Hammon. Jackson and Hammon are considered two of the WNBA’s greatest players of all-time and you can watch them compete against one another when their teams tip off. Men’s Basketball Preview – Thursday, August 2: Team USA will likely dominate their way through their next match-up against Nigeria at 5:15pm ET, just as they did against Tunisia (110-63) in their previous game. Look for Kevin Love to continue playing a major role, as well as Kevin Durant, Kobe Bryant and Lebron James, who simply cannot be guarded. 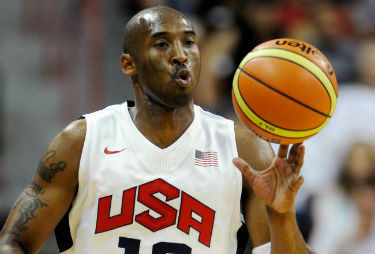 Olympic Men’s Basketball games will get going at 4am ET on Thursday and will stream live online. Look out for the usual solid performances from players like Pau Gasol (Spain), Tony Parker (France) and Leandro Barbosa (Brazil) in their respective games throughout the day. Women’s Basketball Preview – Wednesday, August 1: Canada and France will play in the first game of the day at 4am ET, while Team USA and Turkey will face off in the final game on Wednesday at 5:15pm ET. Other good match-ups to watch in Olympic women’s basketball are Australia vs Brazil (9:30am ET) and Great Britain vs Russia at 11:45am ET. Men’s Basketball Preview – Tuesday, July 31: Team USA easily got past a Tony Parker-led France team on Sunday, winning 98-71 in their tournament opener. Kevin Durant scored a team-high 22 points in his first Olympic game and Kevin Love added 14 points of his own. Team USA will now face Tunisia at 5:15pm ET on Tuesday, which should result in another easy win. You’ll also want to be sure to be sure to watch Spain vs Australia at 6:15am ET and France vs Argentina at 3pm ET. Argentina’s Manu Ginobili and Luis Scola are among the big names to watch, in addition to Brazil’s Leandro Barbosa, who leads his team against Great Britain at 11:45am ET and Spain’s Marc and Pau Gasol. Women’s Basketball Preview – Monday, July 30: Olympic women’s preliminary basketball games are going on as we speak and the Team USA will will play in the final game of the day at 5:15pm ET against Angola. China defeated Croatia the first match-up this morning, while Turkey defeated the Czech Republic and and Australia was upset by France. Among the players still left to watch today are Team USA’s Candace Parker and Maya Moore, Great Britain’s Kim Butler and Canada’s Michelle Plouffe. Men’s Preview: Team USA is expected to run through the competition and win Olympic gold for the second straight time and the twentieth time overall. Spain is expected to provide the biggest challenge for Team USA because they have a lot of size in Marc and Pau Gasol and Serge Ibaka. Argentina and Brazil could also reach the podium, but their chances of knocking off a US team that includes Lebron James, Kobe Bryant and Kevin Durant appear to be slim to none. Women’s Preview: The US Olympic Women’s Basketball Team, which includes star WNBA players like Candace Parker, Sue Bird and Maya Moore, will be looking for their fifth straight Olympic gold medal. Australia, led by three-time WNBA MVP Lauren Jackson, will likely give the US women’s team their biggest test, as they have won silver medals at the last three Olympics.